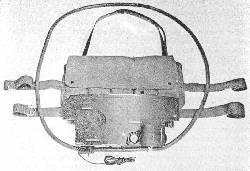 The Gürtelpeilgerät (belt-worn direction-finding apparatus) was a small, portable, tuneable RDF-intercept receiver developed during WW2 for the German Ordnungspolizei (city police public-safety unit). Its main application was close-in detection of clandestine transmitters. This unusual set was featured on a British 5-part mini-series on the SOE (Special Operations Executive), which was broadcast about two years ago on Canada's History Television channel. The series comes up from time to time on the US History Channel. One episode went into the SOE's clandestine wireless communications from occupied Europe in quite a bit of detail. 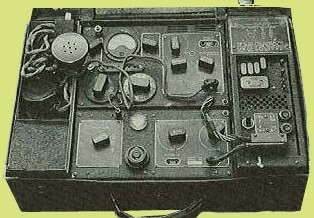 The agents used attaché-case HF transceivers (such as the B2) which were a technological marvel for that era. These radios had 10 to 20W RF output, and put in a good CW signal in England. A German engineer named Meyer developed RDF and detection techniques which were so successful that similar methods are still in use. A Funkpeilwagen (RDF van) was usually a van with a wooden superstructure concealing the DF antenna. The wood offered minimal attenuation to the signal. SOE wireless ops were under standing orders to limit transmissions to no more than 5 minutes, though many of them stayed on for far too long. German fixed monitoring stations would triangulate the signal source to within 2 - 3 km, and then the Funkpeilwagen would be sent into the general area. Once it got an accurate bearing, an operator would get out and walk around with the Gurtelpeilgerät handheld/body-worn RDF receiver. (Ref. 3, p. 71-75). The German RDF operator would then go to the electrical service panel of the building. Either by watching the rotation of the electricity-meter disc (it would pulsate with the keying), or by switching off the mains to each apartment in turn until the signal disappeared, he would have his quarry. The former method was preferred, as it would not alert the luckless wireless op. However, if other loads (e.g. a stove) were causing the meter disc to turn fairly fast, this would mask the varying demand of the transmitter. If I recall correctly, the FBI also utilised this method during WW2 to capture enemy wireless ops in New Jersey or New York State. The wireless ops became fairly adept at countermeasures. When the lights went out, the op would not resume when the mains went back on. Alternatively, he would power the set off a car battery, Also, the operators used to change frequency in the middle of a transmission, according to a prearranged schedule. (Changing frequency involved changing a quartz crystal and plug-in coil, and resetting tuning knobs to a preset mark). Otherwise, another op 10 to 20 km away might pick up the transmission on a different frequency. The movie "The Looking-Glass War" has a sequence at the end in which the DDR-Funkpeildienst (former East German RDF service) catch the poor, miserable amateur agent by using the techniques described above. Incidentally, in wartime Britain, a Post Office Radio Branch permit was required for the purchase of an audio output tube from a wireless shop. Applying for the permit triggered a background check; several enemy agents were caught that way, trying to buy such tubes for use in clandestine transmitters. Die Funkpeilung der Kurzwellen im Nahfeld, Teil I. - Ein Lehrbuch für Beobachtungs- und Peilfunker der Ordnungspolizei (1943). Die Funkpeilung der Kurzwellen im Fernfeld, Teil II. - Ein Lehrbuch für Beobachtungs- und Peilfunker der Ordnungspolizei (1944). Fritz Trenkle: Die deutschen Funkpeil- und -Horch-Verfahren bis 1945. Arthur O. Bauer, "Some Aspects of the German military Abwehr Wireless Service"
SMECC: Agent Radio Operation during WW-II. Copyright © 2003-2009  A. Farson VA7OJ/AB4OJ. All rights reserved.